While waiting for Carian Cole’s next book Torn, I decided to re-read Vandal (2nd book in Ashes & Embers series). Actually I’m reading the 2nd version of Vandal – Carian rewrote part of the last chapter and the epilogue. Vandal is true to his name, trespassing your mind and leaving everything wrecked behind him, like a trail of a tornado. A very hurt, sad, angry tornado. And that tornado happens to cross paths with another broken soul, Tabitha. And he is determined to heal her and get some remedy himself. Anyway, this dish is from the beginning of the book. Vandal cooks for Tabitha and she’s really surprised that he has such skills. As soon as we walk through the doors, I can smell food cooking, so he must have started dinner while I was out on the boat disappearing. He doesn’t strike me as the cooking type, but I guess he’s just full of surprises. 1. Preheat the oven to 225 ‘C. Soak some toothpicks (two to each chicken breast) in water. 2. Cut a pocket to each chicken breast starting from the thicker side of the meat. Be careful not to cut all the way through. 3. Stuff the pockets with slices of ham and cheese. Close the pockets with toothpicks. 4. Heat a mixture of olive oil and butter in a frying pan. Fry the chicken breast until golden brown and then put them on a baking dish. 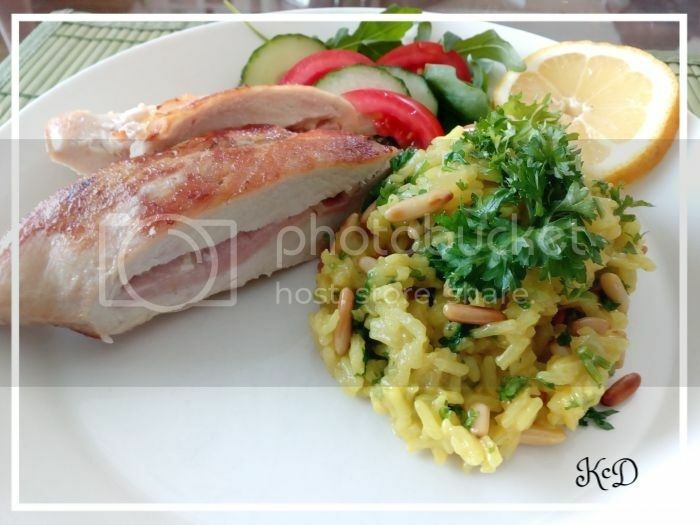 Squeeze the juice of a half a lemon on top and bake the chicken breast for 25-30 minutes until done. 5. Chop the onion fine. Heat olive oil in a pan and sauté the onions. Then add the spices and rice and sauté them until the rice is translucent. Add the water and lid and cook until done. 6. Heat a frying pan and roast the pine nuts on a dry pan until golden brown. 7. 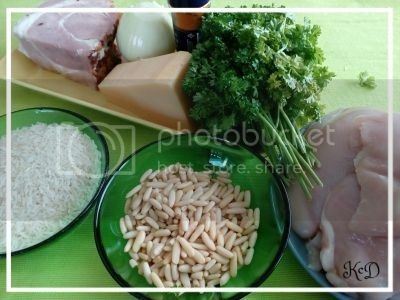 When all the water has absorbed, chop the parsley and add it and the pine nuts into the rice. The chicken should be ready at the same time. Enjoy! I didn’t get Vandalised.. I wanted to, but it just didn’t happen. I just couldn’t understand how Vandal would use Tabitha in such devious way just to ease his own pain… well I couldn’t untill the end which ruined the story for me.